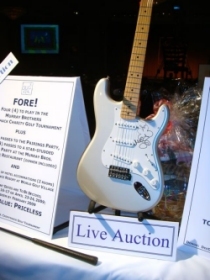 $5000 for an autographed Miley Cyrus guitar, $7000 to play golf with Bill Murray and his brothers, and $3500 to attend the Project Runway finale and see your name in lights in Times Square– these were just some of the deals bidders won at the Friends of the Family’s 12th Annual Family Matters Benefit and Celebration. The May 30th charity event at the Beverly Wilshire Hotel in Beverly Hills, California raised more than $450,000 and drew celebrities such as Access Hollywood co-host Nancy O’Dell, Dan Cortese, Melissa Joan Hart, Ross “The Intern” Mathews, and VH1 Celebrity Fit Club’s Stacy Kaiser. The evening started with a silent auction where guests bid on items such as a Kobe Bryant jersey and a Sony private screening for 40. Afterwards, Mad TV’s Debra Wilson-Skelton served as the auctioneer for the live bidding where she helped raise a little over $20,000 on only five items. Guests also enjoyed a delicious dinner while watching legendary Olympic figure skating champion Scott Hamilton receive the 2008 Spotlight Award, which was followed by dance performances by children of Friends of the Family programs.